Several books are published every year by the museum and the art centre: catalogues, monographs and artists’ books. You can see them in the shop areas of the places and in the on-line catalogue below. 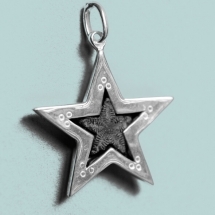 Relaunching Digne’s traditional goldsmithing and silversmithing craft of St Vincent Stars, the Musée Gassendi shop proposes items created specially for its visitors, which can also be seen below. To order the books and/or the catalogues, download the form to your computer. 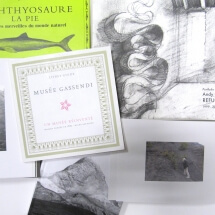 After filling in the form, you just have to print it out and send it with your payment by cheque payable to Régie du Musée Gassendi.